John's possible Diana Hollywood vase??? 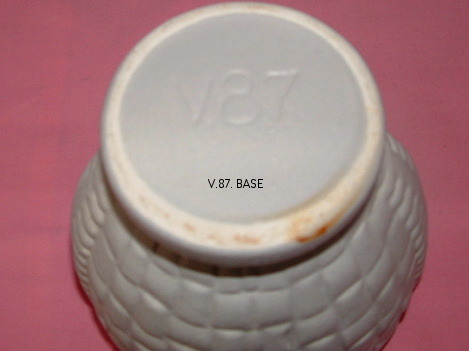 A number of Australian potteries used a numbering system that had a letter denoting the kind of ware, T for trough, W for wall vase (also known as welcome vases), V for Vase etc I think the numbers just ran sequentially although some of the early Diana ones look to have had a shape number, a dash and then another number indicating the height in inches. 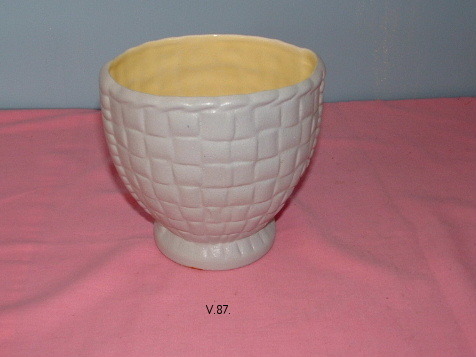 "The People's Potteries" reproduces pages from Diana catalogues from 1947 and 1950 with the highest V number being V60. None of the reference books I have illustrate that particular vase but Encyclopaedia of Australian Potter's Marks, Ford, G, 2002, Salt Glaze Press, Wodonga says Hollywood was produced in the early to late 1960s - some have an impressed "Hollywood" and some a Red on Silver foil paper label with Hollywood over a Map of Oz. It'd be worth googling "diana" and "hollywood" and also looking through current and expired listings on eBay. eg 380104415480 is a Diana V80 with a similar feel to John's piece and 250379653773 is a V86 which could be a cousin.